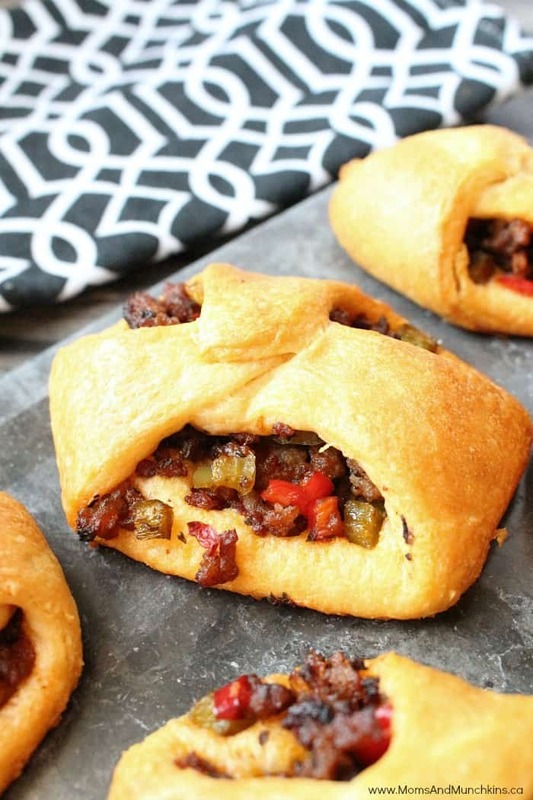 These tasty Sausage & Pepper Turnovers can be served as a party appetizer or as a main meal. For a delicious family dinner, serve them with a side salad or garlic ranch potatoes. 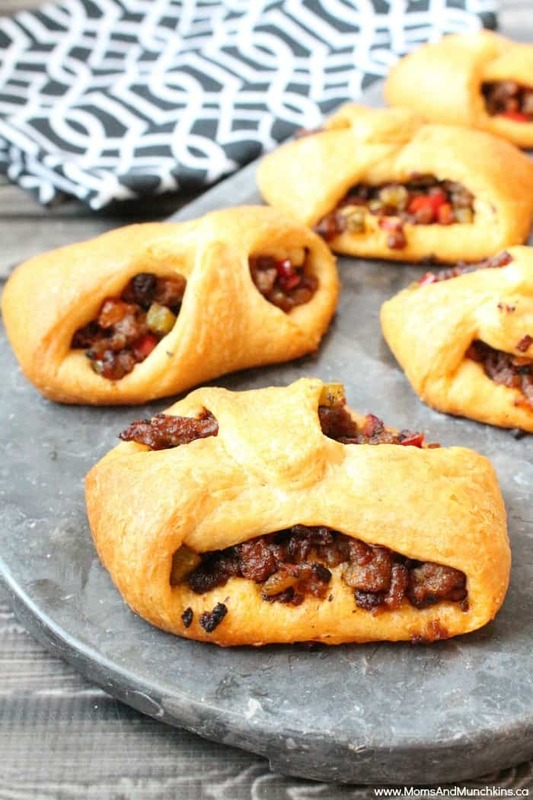 These are really easy to make as they use Pillsbury Crescent dough (no making dough from scratch – phew!). If you can’t find ground Italian sausage for this recipe you could use cooked sausage chopped into bite-sized pieces instead. The sausage meat can be quite greasy so you’ll want to drain the grease out of the frying pan before adding the rest of the ingredients. In a large nonstick skillet, cook sausage until thoroughly cooked. Drain grease. Add onion, peppers, basil and salsa over medium heat for 5 minutes. Unroll dough; separate into 8 triangles and place on an ungreased baking pan. Place a spoonful of filling mixture onto each triangle and fold each of the 3 points into the centre over top of the filling. Pinch the points together to seal. Another recipe I love that uses Pillsbury dough are these Chicken, Apple & Brie Turnovers. 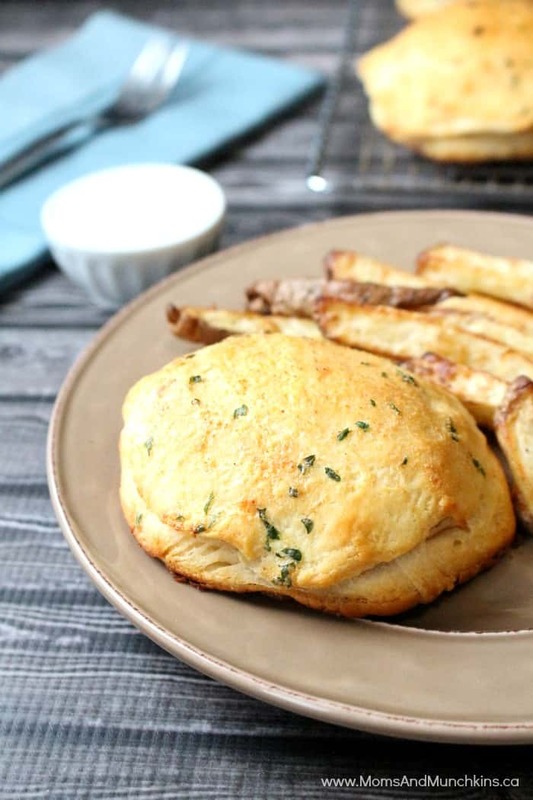 They taste like a homemade pizza pocket and you can substitute the chicken, apple and brie with your favorite pizza toppings instead like pepperoni, mushrooms, tomato sauce and cheese. It’s a yummy lunch idea that kids will love! We’re always adding new recipes & party ideas to Moms & Munchkins! Never miss an update by following us on Facebook, Twitter, Pinterest and Instagram.